To say the least, "Rango" is an interesting piece of entertainment. There was what I expected going into the film, an above average family flick with A-level talent in front of and behind the camera as well as some amazing animation that would translate a story of adventure through the always reliable critters that make the kiddies laugh. And then there is what I felt about the film as I exited the theater. It had very much met every expectation I held for it, if not exceeding most of them. The talent of course consists of the oddest but biggest movie star in the world Johnny Depp re teaming with his "Pirates" director Gore Verbinski in what is more or less an experiment in how far they can take a film that is coated to look like a children's movie and have it contain enough nods to philosophy, religion, government and a few pop culture bits to say this is more of a discussion than a feature film, but it does possess and old western storyline and the animation is indeed breathtaking, but it isn't really for the children. 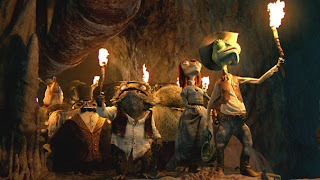 "Rango" is simply an inventive and very good film that has no particular audience in mind. With that being said, it also means that this film could potentially be for anyone. It certainly has a broad spectrum of appeal that includes quirky humor spouted by rodent characters crafted after the most general of western stereotypes that seemed to have been turned on their heads (the supporting players here are one of many great highlights of the film). It features a genre that only seems to be getting better with time, a western that takes the classic atmosphere and allows our title character to compile a kind of manifesto for himself while living out his dreams and aspirations that he no doubt thought would ever venture past his secluded glass tank. And while younger children may have a little trouble understanding some of the plot points, the visuals are so stunning that once their brain gets past the eye candy they are enjoying they will understand just enough of whats actually going on to never get bored with the nearly two hour film. It is funny that this is probably more appealing to adults if they can get past the simple fact that it is an animated film, but more than anything this seems to be a genuine movie for people who love movies. The humor of the piece was so sly and random, I was literally laughing for about three minutes straight at one point and I'm not even sure there was an intentional joke for me to be chuckling at. Instead it is a credit to the performers in these roles, that they have fully invested in and aid incredibly in making the world of "Rango" feel as life-like and zany as its makers intended it to be. This is in part due to the fact that the film was made with motion capture rather than simply having the actors read lines in a recording booth (think more "Avatar" than "How to Train Your Dragon"). I would love to see the footage of the full cast acting out their parts as if it were a stage play, but for their first outing on an animated feature ILM has made one of the most gorgeous films to date. The animation is really to be commended here, there are certain landscape shots that looked to be a mixture of live action camera work and animation that are done so flawlessly you can't be sure if what you are looking at is real or not and if it is all CGI than that is even more amazing. Seriously, if you go to see this movie for one reason it should be to glance upon how far animated films have come. There are so many more great reasons to venture out and see "Rango" though, not only does Depp deliver another zany character to his arsenal but he redefines what makes him such a versatile actor. He takes Rango from being a dreamer to a do-er, from his opening monologue about acting and his many jokes with the naked top half of a barbie doll to his climactic overcoming of the small towns problem with which he solves as their proud sheriff is cut between a few high tense action sequences and a ton of creative dialogue and well written characters. 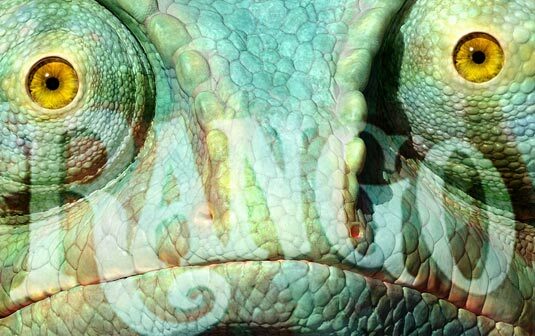 "Rango" may not have had a specific audience in mind but that has made it a film that is to be loved by a variety of movie goers as well as marking the first great film of 2011. If the rest of the movies that are released this year are half as creative and skillfully crafted as this one, we should be just fine.